How can Blackberry win the student market? mobileYouth: There's a battle going on right now between RIM Blackberry, Apple, Nokia and MS to win the influential student beachhead. How does BBM fit into the picture? How is this affecting SMS usage? We'll offer advice for mobile operators and handsets in engaging students as well as some exciting insights from high growth markets. Join us as we share youth insights gathered by our youth research partners from around the world on how and why young people choose their mobile phone networks. Furthermore, we will provide the key drivers to youth churn and how it can be overcome by increasing fan loyalty. We'll share our latest global insights into youth mobile trends specifically aimed at product development, marketing and consumer insights managers. The latest youth mobile case studies, statistics and market trends in 25 minutes. From the BIG IDEA to the SMALL WHATEVER - who's winning the youth marketing game today? What are the biggest mistakes made by youth marketers today? Join Graham Brown of Youth Research Partners for a 30 minute exploration of the key themes in how youth marketing has changed irrevocably. We'll be examining the latest trends and understanding why "marketing to" is no longer effective. We'll be sharing global youth research insights and best practises to save your company money and your own face. Join us live as we spot the worldwide trends in mobile phone usage that have young consumers moving beyond SMS. Let Ben Leis and Graham Brown explode a few myths for you. Why is the myth of "free" and "cheap" not helping mobile companies in developing valuable relationships with young customers? We'll also look at key insights from our latest research including the role of Control, Recognition and Reliability in garnering youth loyalty. Join us live for a webinar on how young people are creating movements aimed at educating and keeping people alive and healthy. Our special guest panelists include Dr. Leonard Sender of the I'm Too Young for This! Cancer Foundation and Pat Padraja of Driving for Donors. Join us live as we discuss the action sports movement in the United States and China with our special guests Issa Sawabini of Fuse Marketing, Action Sports Consultant Ian Votteri and John Solomon of Enovate China. Youthsourcing: How Brands Co-Create with Young Consumers. Learn from the experts on how smart brands are transitioning from traditional marketing strategies to the adoption of new methods that focus on existing customers. Youth Research Partners Presents the "Young Ideas Salon"
Join us live as our expert panel discusses...Fanspotting: Identifying and sustainably engaging your most passionate customers. Youth Research Partners presents "What Youth Think"
If you're looking for a marketing guru for your brand - hire a 18 year old! There's no better means then to really listen to what youth have got to say. Experience live youth insights as we bring you the What Youth Think webinar series this Wednesday with Bernard Hor. Join us live as we look at where young consumer's loyalties lay when it comes to mobile handsets versus network providers, the price argument that everything must be free or cheap when it comes to youth, and the risk aversion when it comes to switching networks. Graham Brown and Ben Leis discuss the trust and advocacy issues that drive young consumers towards brands that are "loved" rather than to those that are simply "liked". This week Graham Brown of mobileYouth talks to Andres Colmenares - our Youth Research Partner from WabiSabi Lab in Spain to share his latest insights on their branded community work with Pernod Ricard (Absolut). We take a look at three brands that bring together their beachheads by creating online communities. 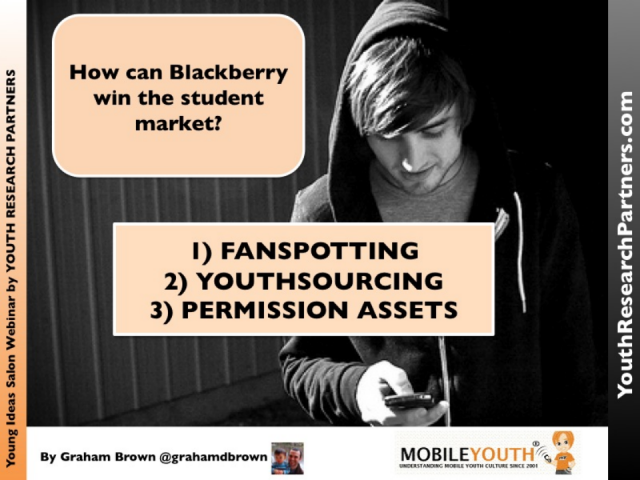 Title: How can Blackberry win the student market?